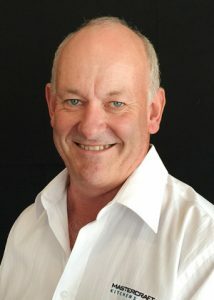 Mastercraft Kitchens Pukekohe is operated by Gavin and Margaret Campbell, and services the Pukekohe, Franklin, North Waikato and wider Auckland regions. Functional, stylish designs for kitchens, bathrooms, offices, laundries, living and entertainment spaces, and other areas of your home or business. Individually tailored designs to ensure that your needs and desires are meet. Design services to plan stage, or fully project managed. Qualified and experienced cabinetmakers and installers. Excellent attention-to-detail and high quality materials and workmanship on every single install. Services available nationally and internationally – whether you are planning an inner-city apartment, rural homestead, family home, holiday home or anything in between. Our Mastercraft Kitchens 10-year workmanship Guarantee on every kitchen, transferable between owners. Our experienced designer Kim Primrose has been designing kitchens and interiors since 1999 and is a colour and design expert. Kim became a Certified Kitchen Designer (CKDNZ) in 2010 and holds the New Zealand Certificate in Design. As well as providing design services for the Franklin and wider Auckland region, Kim also designs for international clients. She is a member of the Certified Designers Society and the National Kitchen and Bathroom Association (NKBA). Visit our showroom at 121 Manukau Road in Pukekohe to discuss your dream kitchen. “I’d like to thank all the team at Mastercraft Kitchens Pukekohe for a fantastic kitchen build and design. Ours was a big project as we were extending out to create a bigger kitchen. Kim came up with a design including all my kitchen desires, even ones I really couldn’t envision fitting in the space we’d allocated. Clarks Beach, Waiau Pa, Kingseat, Karaka, Drury Papakura, Manurewa, Papatoetoe, East Tamaki, Waiuku, Awhitu, Pollock, Manukau Heads, Hunua, Kaiaua, Paparata, Ararimu, Paparimu, Ramarama, Maramarua, Miranda, Waitakaruru, Pukekawa, Onewhero, Port Waikato, Tuakau, Bombay, Pokeno, and surrounding areas. Photo credit: The kitchens on this page have been created by Mastercraft Kitchens Pukekohe. Thank you to our fabulous clients who invited us into their home to photograph their dream kitchens. Photography by Jamie Cobel. The kitchen with timber benchtop was photographed by Bladescenes. Showroom hours: Mon to Fri: 9am to 4pm. Saturday: By appointment. Sunday: closed.